Released twenty five years ago today, on June 7, 1985 was The Goonies, an action adventure movie for kids written by Chris Columbus, directed by Richard Donner, and with a story by Steven Spielberg (who also produced the film along with a handful of others). The anniversary of this pop culture gem prompts more questions than analysis on the part of this reviewer. 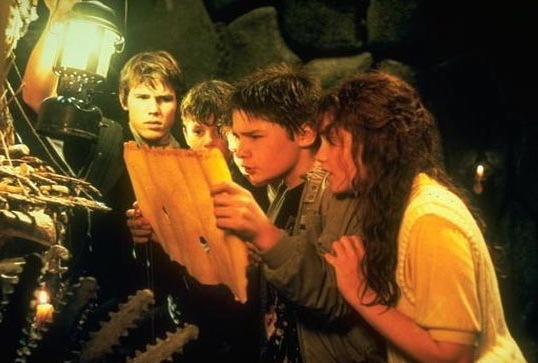 Ostensibly, the film is about a group of misfit youths, led by Mikey Walsh (Sean Astin, long before his Lord of the Rings days), who believes that he has located a map to the buried treasure of a mythic pirate, One Eyed Willie. 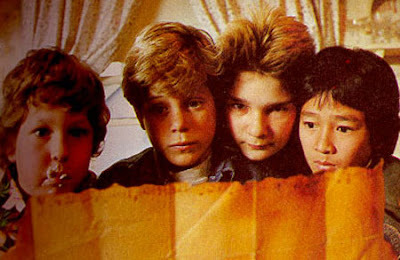 With him are Mouth (Corey Feldman), Data (Jonathan Ke Quan, just a year after he appeared as Short Round in the first Indiana Jones sequel), and Chunk (Jeff Cohen). The two are joined by Mikey's older brother, Brandon (Josh Brolin, looking so young you'd never think he would grow up to play a president or appear in a Coen Brothers movie), his would-be girlfriend, Andy (the lovely Kerri Green), and her sassy friend, Stephanie (Martha Plimpton). Adding to the conflict are fun villains Ma Fratelli (Anne Ramsey), Francis Fratelli (Joe Pantoliano) and Jake Fratetti (Robert Davi) as well as unlikely hero Sloth Fratelli (John Matuszak). In sum, it's a fun ensemble piece which requires a bit of disbelief suspension. The Goonies grossed US$9 million in its opening weekend in the US, second on the charts behind Rambo: First Blood Part II. 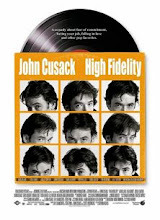 It grossed over US$61 million that year, placing it among the top ten highest grossing films of 1985 (in the US). However the film was a box office disappointment. The year before the same studio and film producers released Gremlins, which grossed $145 million. 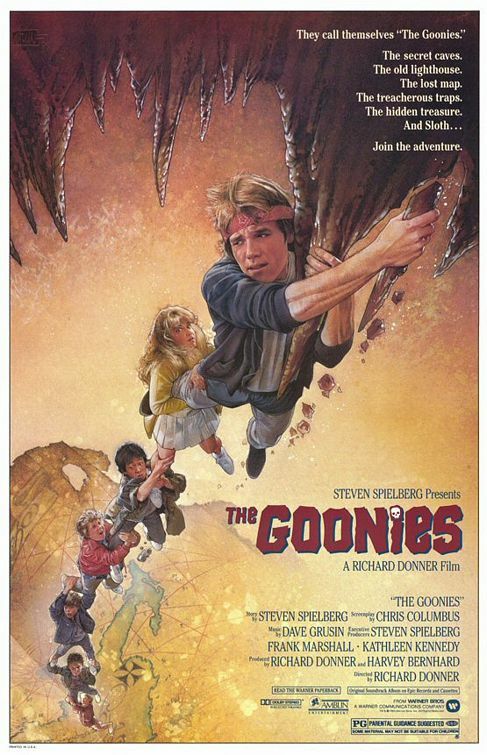 All parties involved thought The Goonies would equal the success of Gremlins. 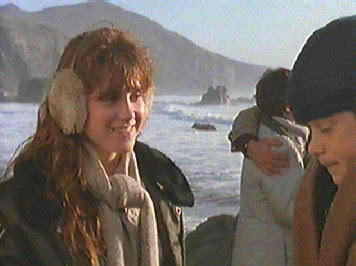 In the decades following its release, The Goonies has gained a cult following, primarily of people who were children or teens in the 1980s. There have also been fan festivals in the town of Astoria. But the real question: Would children of the 2010s enjoy this film, and would adults enjoy it today were it not infused with some sort of nostalgia for their '80s era youths? The answer: Probably not, on both counts. I'm not certain I ever saw the film all the way from beginning to end until yesterday. This is not to say I've not watched the film many a time, but it was always the sort of flick I would keep watching if I stumbled upon it on cable television. I don't recall seeing it at the theatre in 1985 (though I do remember much elementary school discussion about its video game spin-off). Never having owned it, I would simply watch it when it was on, and enjoy it for what it was: a campy big budget adventure movie for kids (featuring a lovely red-headed actress, no less). But I wonder how well the film has aged. These are not young characters who spout off ironic pop culture references or carry about cell phones and handheld devices. They are not cynical and self referential in the way that so many high school students or young children are depicted in film and television today. 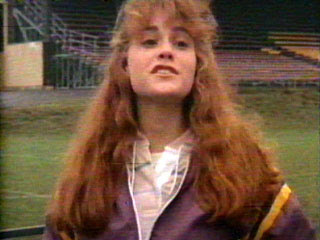 That makes me wonder how the self aware children of today would view a film like this from 1985. (Remember, this film came out a few weeks before Back to the Future, and a few years after the last of the original Star Wars films. It was a long time ago.). What to think? Would it be too simple? Not dark enough? Too slapstick? Dare I say it, too 1980s? Watching the film yesterday, I wondered how much of my enjoyment stemmed from the fact that I remember enjoying it and watching it when I was a child in the 1980s. Does that inevitably influence my own opinion of the film, two and a half decades later? When viewing something of this sort, am I, a thirty-something viewer, inextricably intertwined with the pop culture tastes of my adolescent self? There may not be an answer. Whatever you do to celebrate and observe this anniversary, be certain to check out the great 25th anniversary coverage of the Branded in the 80s blog. I saw Goonies during opening weekend of its theatrical release at a neighborhood theater which appeared sold out, but had not a single adult in attendance (ah, the days when parents just dropped off kids at the theater without thinking about it). The place was in hysterics during the entire showing, with popcorn and candy flying around, much like when you see classic kiddie film matinees re-enacted. Likely at my folks' house there's still an official Goonies glass bought at Godfather's pizza. And, of course, we had taped the movie from HBO or the like and watched it over and over. I'm not inclined to believe that somehow kids are somehow genetically inheriting their parents' post-post-modern ironic sense of humor, and am much more inclined to believe that kids tend to watch whatever you put in front of them (I sat through a screening of Batman from 1966 yesterday, and the kids loved it, completely missing the camp factor). I do remember as a kid always being aware of the difference between new and old movies and TV shows, including pacing, etc... (One of my favorites was/ is "20,000 Leagues Under the Sea"). I honestly think kids would be more likely to be freaked out by Goonies now than in the 80's as the kids appear to be in legitimate, mortal danger, which is something that's been utterly stripped from most kiddie movies in the nerf-kid age. And actually seeing practical effects? Would probably melt their little brains. I've actually talked to a number of 30-something parents recently about whether their kids enjoy the film, and the answer was a unanimous "no". Most of them said their kids were bored because there wasn't enough stuff blowing up, etc. I found it kind of sad. Interesting to compare SW's account of the '66 Batman showing with conjectures about a Goonies reception amongst today's youth. In Batman, there are constant visual gags and flashy colors, which I imagine appealing both to very young kids (children of 4 were mentioned by SW) and slightly older kids blown away by the constant camp. In the case of Goonies, however, I think there was a much narrower age window to which the film might initially have applied. I for one remember being just barely old enough to get the sexual innuendo (and, as Ransom has mentioned, appreciate the female stars), but not old enough that the goofy humor didn't appeal. And it's true, although there are some scenes of action and suspense, there is a fair amount of buildup (with no explosions) when compared to the kid-oriented suspense movies of today. So, I'm guessing by the time the kids of today are old enough to access what was appealing about Goonies in the '80s, they've already become too jaded by the fast paced CGI extravaganzas of the contemporary young adult film. Personally, I haven't seen this one for a few years, though I have the same kind of deep nostalgia Ransom describes - I have wondered if I can ever go back . . . . The fact that you've only just now watched this movie in its entirety amazes me. Might I suggest watching along with the imdb.com goofs page. Supposedly it has more than most. One key spot is at the end when they show all the camera crew. That's really amazing that kids can't get excited by this movie, but what the heck... I'm never around kids, especially kids around 10 years old, which is about what I would have been when I saw the movie.